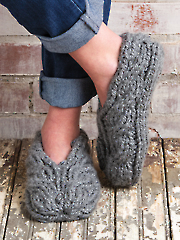 Knit Chunky Cable Slippers with Kristin Nicholas. 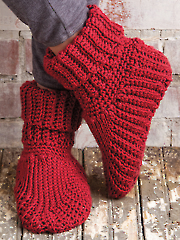 Crochet Slipper Boots with Ellen Gormley. 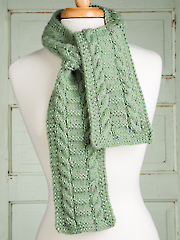 Use simple knitted cables to make the Chutes & Ladders Scarf with Brett Bara. This pattern is the pits. I made the soles just fine (although they are weirdly shaped), but continuing on with the heel and toe is a nightmare. There is NO instruction regarding how many rows are supposed to be put into the stitches around the sole, there is just a random "sl st in the next 2, turn" at the end of the rows.....but those rows don't line up with anything that I can see. Going around the corner of the heel, it stretches way out of shape....and then it says to stop making these rows at what appears to be a random number (12 for size small), and repeat these rows 5 times for size small. That's 30 rows around ONE side of the slipper before even reaching the toe. I'm about to pull my hair out. And now they want me to spend money to watch some video about making this. I just don't think so! I'm just very glad the pattern was free. If I had paid for this mess, I'd be REALLY ticked off! I agree with the negative reviews on these red slipper boots. I have been crocheting for almost 50 years and have never had trouble with patterns. Have ripped these apart too many times to count. The sole was fine to make but after that it's awful. It was encouraging to see a repeat of the show hoping to help get through the problem areas after working it so many times, but that didn't help either. Not a good pattern. Makes no sense in direction. 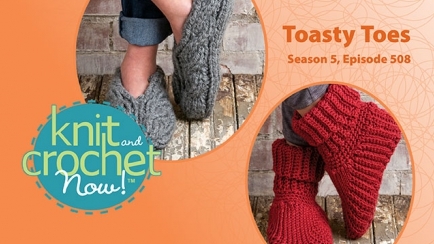 I have been crocheting some pretty hard patterns and always figured it out but this one no luck. I totally agree with Gail, there is something seriously wrong with these instructions !!!!! I have been crocheting since I was 8 and am now 82 so am not lacking experience. I have contacted a lady called Tammyjo who, according to her photos , seems to have made a lovely job of this design.